Cheerwing Syma X5SW-V3 FPV is the most unconventional headless quadcopter drone you will find on the market under $50. If you are of those guys who are intrigued by drones and flying toys, this product is for you and your kid. This latest model from the house of Syma has improved on its First Person View (FPV) video facility. The remote controlled operation enhances your real-time video recording experience. 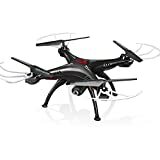 The box comes with a black colored X5SW-V3 quadcopter, a remote controlled panel to hover your drone, a USB charger to recharge the battery included in the set, four pieces of propellers, a phone grip, and one screwdriver to fix the propellers to the body of the drone. The drone with its headless feature reduces the steep angle formed while taking off. It allows you as the pilot to fly the drone with ease. This feature ensures an even flying experience as the onward direction of the flying-rotor does not affect the nose direction. Armed with the 6-axis gyro flight control system, the X5SW-V3 FPV can fly very fast yet steadily. The 0.3 megapixel HD camera and first Person View Video facility enable you to view and capture aerial pictures from the drone with ease. The battery backup of the drone fairs well and lasts up to 6-7 minutes at a stretch in the air and the remote control range is about 50m to fly it around. Furthermore, the USB charging facility of the batteries is quick and hassle-free. 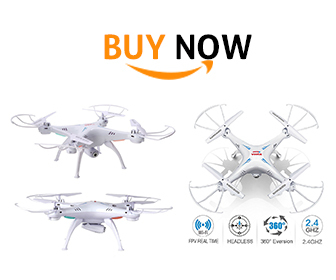 The pros of this quadcopter model are its lightweight, simple and straightforward controls that enable to perform in-air stunts. This drone is a thumbs up for beginners who are willing to experiment with this model. Even though these advantages are good enough, there are down-sides too. The X5SW-V3 FPV does not with Android versions below 4.0, and most importantly it lacks an SD card slot. In addition, the camera quality is quite poor and may not be as clear as you might want it to be. You may not have that amazing experience with the FPV videos and images as you expect. 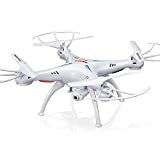 For under $60, this easy to control and use drone, this will assuredly offer a great experience to any inquisitive and nerdy adolescent.